I had the great opportunity to attend a blessed gathering a few days ago. But truth be told, the most peaceful moment for me that night was when I returned home, stepped out of the car, and raised my eyes to gaze at the luminous crescent and crystal-clear night sky. While resting my head against the car door and inhaling the frigid winter air, I had to ask myself yet again, "Where are you going?" It seems I've been asking myself this question for a long time. Thoughts that I scribbled in books some nine years ago are no different, in essence, than much of what I've written on this blog. I don't find myself any stronger, but I only see a deep weakness. Sometimes we need this weakness, sometimes. Regardless of my state, may I never find myself ungrateful. It feels unreal. Perhaps like a chapter from a book. A fish in his bowl listens to the words, and it is nothing more than that. Words or some imaginary phenomenon that lasts only as long as one is reading the tale. This is life in my eyes. If my silence whispered anything to a listening ear, one who dares engage my presence, a presence that only inhales oxygen and exhales carbon dioxide, it would say, "I don't want the sun, moon, or stars, but truth." What is truth? For me, it is to stand in the midst of the desert, with chapped skin, dusty robes, and nothing more than an aura of peace and contentment. Gone is the crown of a title, the status of earnings, the value of aesthetics, the strength in oratorship, the tangibles. In the desert, silence allows the soul to speak and leaves hearts to rest. 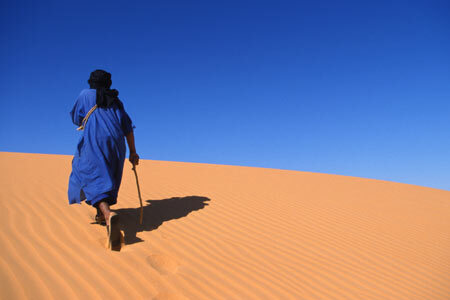 The desert need not be formed of heat and sand dunes. Whatever its form, ya nafsi, it is where we must be, by the grace and permission of Allah, most glorified is He.